We are a leading Manufacturer of water curtain painting booth, liquid painting booth, water screen painting booth, water spray painting booth, wet painting booth and wet type painting booth from Chennai, India. Leveraging on our in-house production unit, we are presenting a wide assortment of Water Curtain Painting Booth. This painting booth offers pollution-less environment. The offered booth is designed and developed in very efficient and effective way equipping it with liquid spray booths, which offer adequate flow of clean air. The standard designs range from an economical model to an excellent performer in quality painting. Liquid paint Booth with disposable filters is an economical choice for low volume spray Painting operations. Well designed filtration/ separator system offers highest efficiency of paint collection. 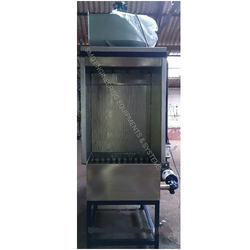 We Offer’s Water Screen Painting Booth provides an extremely efficient means of removing paint particles from the exhausted air by using water as a filtration media, We have designed the Water Screen Painting Booth for many finishing applications. We also offer's pump as well versions in open type model, enclosed type model and conveyorised models. 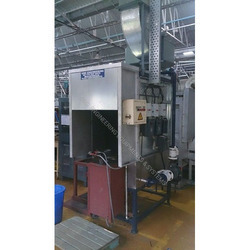 Standard Water Screen Painting Booth is utilized for high volume paint usage, medium or large sized components and batch processes.Water screen Wet type paint booth contains special features like water tank or over spray paint collection disposal tank, specially designed eliminators (baffles), saw tooth plates, washing chamber and high pressure exhaust blower. This type of painting booth is more popular where the paint consumption is more and heavy paint consumption, high production and / for any component. 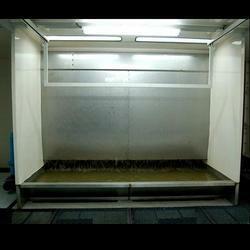 We offer’s Water Spray Painting booth for maximum efficiency and economy uses. The painting booth is designed to maintain an adequate velocity of clean air at t he operator's breathing level and ensure that all the overspray paint is sucked into air filter or in water tank. By keeping the operator's breathing level free from solvent and overspray paint, it is possible to make the operators work continuously for longer periods, thereby increasing production and improving the quality of work. We offer Wet Painting Booth to our clients. The painting booth comprises of a chamber with Stainless Steel and galvanized Iron sheet panel construction baffle chamber is provided on the rear side of booth. This retains the paint-water mixture from the air stream to exhaust clean air. There is a tank above the floor level, in which water is filled. 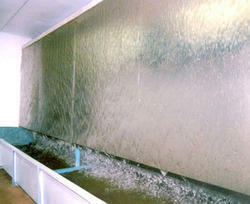 Contaminated air pass into the water and the mixture is drawn into the baffle chamber where 3 rows of baffles are placed. Doors are provided to the baffle chamber to facilitate cleaning periodically. Powerful blower mounted on the top of chamber provides draft. Blower is designed to provide suitable exhaust capacity. The impeller is dynamically balanced. The exhaust from the blower is passed through a duct. 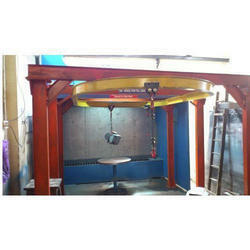 We Offer’s Wet Type Painting Booth to accomplish the pollution-less environment. 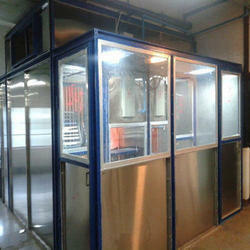 Designed and developed very efficient and effective liquid spray booths, which offer adequate flow of clean air. The standard designs range from an economical model, to an excellent performer in quality painting. Liquid paint Booth with disposable filters is an economical choice for low volume Spray Painting operations. Well designed filtration/ separator system offers highest efficiency of paint collection. These booths prove to be extremely efficient means of removing paint particles from the air by using waters a filtration media. A water wall informed in front of the article by the means of the pump. The over sprayed paint in the air, is pulled towards this water wall and gets mixed in the water by using efficient design of Venturi. These paint particles and resins then converts into the non sticky sludge in the water tank making it easy to dispose off. Scrubber is used for the treatment of the air before being exhausted in the atmosphere. Wet Type Painting Booths with various set of combinations of following features & specifications. An open booth for general purpose. A closed pressurized booth with controlled air quality & velocity. Looking for Wet Type Painting Booth ?